1 Take the two slices bacon and fry in a non-stick pan on both sides until the fat is crispy. 2 Lightly toast the bread, then spread Flora Light over the bottom slice. 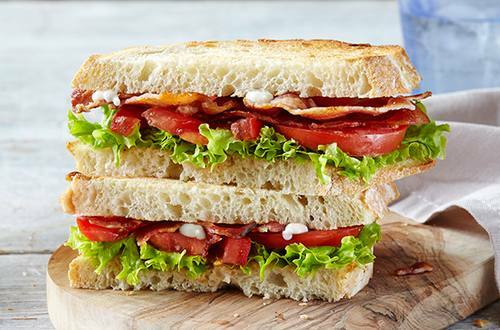 3 Layer the lettuce, bacon and tomato over the bottom bread slice, then generously spread Hellmann's Mayonnaise (to add a wonderfully creamy texture) on the second slice of bread, and place it on the top. 4 Slice the sandwich in triangles, or rectangles if you like.